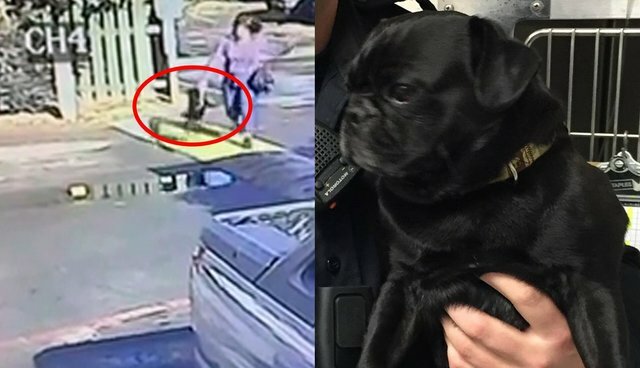 On New Year's Day, police in Fairfield, California had some good news: A pug seen violently flung in a disturbing viral video had been located, turned over to animal services and was found to be OK.
What authorities failed to mention was that the dog, named Benny, was back with the woman seen abusing him that very same day. In December, a Facebook user shared upsetting footage of a woman identified as Brandi Chin tossing a small dog like a bowling ball, sending him sprawling across a driveway. The video quickly spread through social media, leading to a search by officers for both the woman and the pug. "We are currently looking for her at this time. She is, from what I understand, hiding from us," Sgt. Michael Ramirez of Humane Animal Services told KTXL last month. "We are looking to file animal cruelty charges against her and have this dog removed from her because the dog doesn't deserve that." On Friday, police announced that they had finally found Benny and he was determined to be in good health. "Benny the Pug has been located and is safe. He was turned over to Humane Animal Services last night and is currently in their care," wrote Fairfield Police on Facebook. "It is believed the suspect has fled the area and is no longer in Solano County." Later that day, however, reporters with KTXL interviewed Chin at her boyfriend's home with Benny, who had been returned to his owners. According to the station, Chin denied abusing the dog, saying "she simply meant to release Benny" but in the heat of an argument "released him harder to the ground than she had intended." That claim contradicts an earlier statement by authorities, who said they think this isn't the first time she abused Benny. "She was recently seen walking down a business district in Fairfield, and she apparently had the dog by the tail and she was swinging it around," said Sgt. Ramirez last month. Chin has not been charged with any crime, but Fairfield Police say the Solano County District Attorney's Office could still charge her with animal abuse. On Facebook, Fairfield Police defended how they have handled the case, saying, "It is not as simple as just having the video from the internet unfortunately," and listing a number of crimes they have had to investigate since the video was reported to them last month. "The District Attorney's Office makes the decision to file charges and request warrants be issued. We investigate and prepare cases to send to them," wrote Fairfield Police. "We are happy the dog was located safe and healthy."